Antonio Machado's wife died when she was very young. It is through his lifelong anguish over this loss that a kind of sacred spiritual yearning emerges. He begins to see his dead wife as his divine beloved, ever present, ever calling to him, yet ever just out of reach. The goal of union can only be found within. In this way, his terrible ache was elevated to an experience of the sacred, similar to that sought through the ideal of courtly love several centuries earlier. When his poems speak of this beloved woman, read into it the divine, and see what meaning emerges. (Spanish language) Biography, bibliography, and poetry of Machado. (Spanish language) A large collection of Machado's poetry on-line. 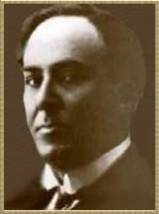 (Spanish language) Poetry, photographs, a biography, and several articles on Antonio Machado. The photographs of Machado's Spain are worth the visit, even if you don't read Spanish.